Video of our first demo; features interviews with MP Emma Dent Coad, Councillor Pat Mason and community activist Niles Hailstones. Filmed Fri 2nd Feb '18. In the summer of 2016 RBKC Council devoted the front and inner pages of Westway magazine to support their claim that the stairs of the much-loved North Kensington Library, made the building inaccessible. 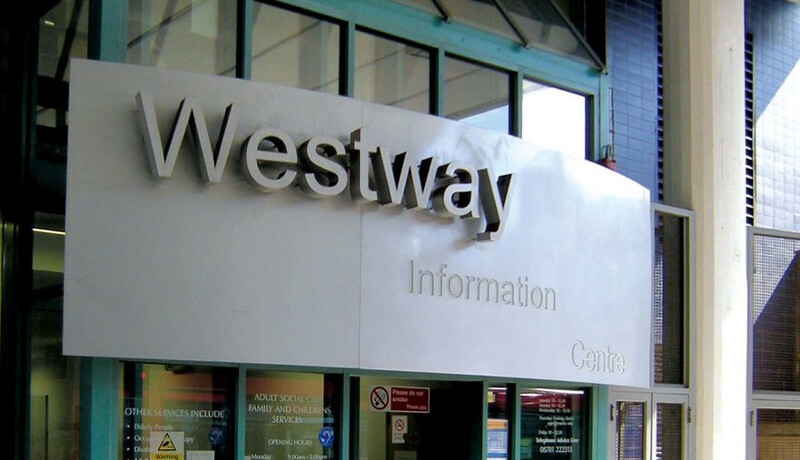 The council did this whilst at the very same time ending the lease of the former Westway Information Centre, and relocating the service to a smaller nearby premises, only accessible via a steep and narrow stairway. The incoherence of these two postions point to a broader picture in which the Council, then under the leadership of Nick Paget-Brown, and Rock Feilding Mellen, were pursuing an asset-sweating strategy which prioritised the commercial value of public land, casting such issues as residents’ consent, public access, and public amenities as minor concerns. In recent months, the Council has claimed that there will be ‘change’ and there will be ‘listening’ under the new leadership of Elizabeth Campbell and Kim Taylor-Smith. In the spirit of this new era, we invite the council to rethink the development plans for the former Westway Information Centre, given away by a sleight of hand. The result of this is that we are now facing the prospect of a private prep school and Pret-a-Manger chain outlet on the 23 acres under the Westway, which is supposed to be community space. We remind Campbell, Taylor-Smith, and their councillors, that the land under the Westway A40 flyover where the former WIC stood, was left in trust for the benefit of the surrounding communities. The ratio of community vs commercial use on the 23 acres has reversed from 80/20 in the community’s favour to 20/80 in favour of commercial interests. Rebalancing this, so that the 23 acres is used according to the purpose and values that the Trust was established to protect, is well overdue. Reducing the land available to the community in order to facilitate the expansion of a £6k per term prep school is, in our view, a misuse of the land; and the use of council funding to pay for building development works is a misuse of public funds. The School’s decision to sublet part of their lease to corporate interests - that not only do not enhance, but actively threaten, the mix of independent and community led activities on the 23 acres - demonstrate a worrying level of ignorance from the School about the interests of the local community. Pret-a-Manger is famous for employing precarious workers. They like to employ people who can afford to take home very low wages, often those who are young and without children, or casual workers. Therefore, while their product range, with baked kale and protein pots, might meet the aspirations of the affluent, their business model takes no account of the need to support workers with family and caring responsibilities, the very foundations of the community who have stepped up to the crisis in North Kensington and are the fabric upon which our area depends. We, the community, can not affort to subsidise this business with sub-living wage labour in exchange for the sleek aesthetics of global consumption. In the wake of decisions about North Kensignton Library, and Wornington College, our commuinty knows that it is never too late to go back on signed agreements. In the spirit of the new, listening, community-led and culturally sensitive culture that Campbell and Taylor-Smith have described, we invite the Council to note that RBKC has broken planning guidance by letting another chain into North Kensington, rather than an independent business. This degrades the character of North Kensington and its economy. We ask that Campbell and Taylor-Smith review decisions made by the old regime at the Council, thereby embracing and affirming a new era of community-led decision making for North Kensington. The right thing to do now is to re-think the future of the space with an open process accessible to all concerned, to design something that reflects the needs and desires of this community, with a fresh start for 2018. "The Grenfell Action Group has learned, via the Freedom of Information Act, that the cost of stripping out the interior and recladding the exterior of the former WIC premises will cost RBKC council tax payers nearly £1 million." An additional FOI request (REF: 2017-1855) was made to RBKC council on November 28 2017, we are still awaiting a response. We are asking local community groups, organisations and individuals to co-sign this statement, please fill out a form below, and share with your friends. Westway23 stores personal details you provide, securly on our server, we do not pass on any user information to third parties or intend to use it for any marketing purposes, now or in the future. Ram 31 Jan 2018"Stop stealing from the people,"
Sarah Ramage 01 Feb 2018"we don't need coffee shops we have literally loads. We need spaces for young people to get them off the streets, activity centres youth clubs"
Melanie Coles 01 Feb 2018"Supporting Westway 23 and my whole community 💚"
H Palmer 02 Feb 2018"Please rethink this development, it’s not great"
ben dellow 02 Feb 2018"enough!" Davinia 03 Feb 2018"Pret looks very much out of place in an area that thrives on a unique culture. This mainstream outlet does not fit it, it is not their to help/support/serve the local community. The building should've been left for the community not another chain that will ruin the uniqueness of Grove." Vanessa Best 03 Feb 2018"We don't need another coffee/cafe on the stretch of road... how will this benefit the community... and what about the coffee shop in front of it... i suppose he will gone by the end of the year if this goes ahead"
Jonathan Pandy 03 Feb 2018"Utter waste of community land, formerly our citizens advice bureau.. Theft of community space by another faceless chain for private profit by pretentious posers at the expense of local businesses." Rick Britt 04 Feb 2018"Looks like RBKC Councillors need reminding that it's the Council's job to provide STATE education and to support the community, NOT private education businesses and other businesses! Any Councillor who doesn't get this simply shouldn't be in the job - just leave and join the commercial world instead please." Miranda Dickson 04 Feb 2018"WHY WASNT I CONSULTED!!! I have a local voice i would have wanted to use - how dare you make decisions for the community without involving us!" Jessica Jones 05 Feb 2018"I'm not anti-Pret, but this is inappropriate in this location. North Kensington has a unique community, with it's own strong identity - a rare thing in this homogenised world. We need businesses that support the community by being part of the community - i.e. owned by local individuals, giving long-term employment to local people, and offering goods and services that the community needs - not through a charitable trust." Sue Duggins 05 Feb 2018"Anything under the Westway should be what the community want, to support communityneeds. A chain coffee shop is not needed or wanted. Why was I, as a resident, not consulted. Hands off our community. Reclaim Ladbroke Grove"
Marian Skeen 05 Feb 2018"Land left in trust for the community. Now trust is broken yet again by RBKC"
Bernadette 06 Feb 2018"As a long-term resident of Ladbroke Grove, with family living here for many generations, and the mother of three sons born and raised in these streets, I wholeheartedly object to the blatant mis-use of Westway land, which I fought hard to keep for the community." Emmanuelle de la Lubie 06 Feb 2018"Hands off our community land!!!" Pat Mason, Golborne Councillor 06 Feb 2018"The plan was clear: Paget-Brown & Feilding-Mellen wanted to turn the Westway Information Centre into a Ladbroke Grove shopfront they could sell to the highest bidder to add to the Council's property-earning empire - currently £1m a year. I & other Lab Cllrs opposed the destruction of the WWIC but there are more Tories than us so they voted it through. When we & local people run the Council there are going to be radical changes to stop this sort of abomination." Liz Sippy 07 Feb 2018"I work in W10 every Tuesday as a volunteer therapist. Pls listen to your amazing local community!" Barbara 07 Feb 2018"This is yet another betrayal of the North Kensington community, this is community space." Oliver W J Tuck 08 Feb 2018"This Is Our Land! No Prep,No Pret The 12 golden state primary schools within a 2 mile radius of the former Info Centre: Barlby,Middle Row,St Charles,Oxford Gdns,Colville,St Mary,St Thomas,Bevington,Thomas Jones,St Francis,Avondale.St Clement & St James - There is absolutely no need or demand for a Lord Snooty socially exclusive £6,000 a term Prep School in the Ladbroke Grove area." Murray 08 Feb 2018"Kensington & Chelsea Council, wake up - all over London, attempts at social cleansing by local councils are being fought and will be defeated!" qendresa 12 Feb 2018"such bold business deals in a community still hurting from your negligence RBKC. leave grove alone!!! leave grove alone !!!!" Rachael Stone 13 Feb 2018"I grew up in W10 and still work in W10. Horrified to see a business on community land"
KiranJames 13 Feb 2018"As a Grove resident, having grown up and lived in the area for most of my life, and as someone who has dedicated the majority of my working life to community and youth work; I am disgusted and saddened to see that our council still continue to ignore the needs and wishes of the local people! CommUnity; No Pret, No Prep"
Sammy Todd 16 Feb 2018"The Grove belongs to the people and we want our Grove back....since 2008 our area has been systematically taken over in a bid to dissolve the strong community and voice - Justice for Grenfell is paramount as is reclaiming all that has been taken from us"
Karolina Hardy 16 Feb 2018"No!" PortobelloCafeSociety 16 Feb 2018"Council completely lacks imagination, empathy and understanding of needs of North Kensington community." Sylvia Parnell 16 Feb 2018"Council completely lacks imagination, empathy and understanding of needs of North Kensington community." Leearna Oliffe 17 Feb 2018"This land belings to the residents not the private sector. We are inundated with coffee shops, the last thing we needed was another on. We are families with kids who live average luves. We don't have the money or need for private prep schools either...how does that benefit us...the majority?? We e need to work for the many, not the few!" Frances WATSON 17 Feb 2018"Westward (no) Trust and Rotten Borough of K and C again rob the comminiyu"
natasha langridge 17 Feb 2018"This is our land and should be used for community benefit." Alison Owen 17 Feb 2018"Please stop this appalling development and give the space back to the community as intended"
Oliver W J Tuck 20 Feb 2018"No Prep No Pret"
Cezary Bednarski 25 Feb 2018"Community land should not be put for commercial use that is of no benefit to the community"
William O'Mahony 27 Feb 2018"I like Pret-A-Manger but this isn't the place for it." Cordelia Bradby & Sam Godfrey 28 Feb 2018"Keep our Ladbroke Grove! Keep our Portobello community! Stop thieving from the TFL Westway agreement of the early 1970s...please"
Naomi Israel 03 Mar 2018"This has to stop. I'm sick of public resources used for private gain." Pepe Petos 05 Mar 2018"Good work guys, keep it up!" Alex 01 Apr 2018"A Westway Information Centre is vital to the local community. Perhaps the Pret could be downsized and the WIC re-established next to it? There are plenty of food stalls along the Westway/P'bello so don't know why a Pret was set up. It's bland in comparison to independent food stalls." Andrew Curry 08 Apr 2018"Applauding your stand for community interests over commercial chains and private schools." Honey 16 May 2018"RECLAIM LADBROKE GROVE"
Oliver Tuck 01 Jun 2018"There are 12 excellent state primaries within a 2 mile radius of Ladbroke Grove station. There is no need or want for a socially exclusive socially divisive Prep School @ £6,440 a term on community land. Job and studying advice from a bespoke Westway building is badly needed." Listen NHH 21 Dec 2017"We support you 100%"
Friends of North Kensington Library 08 Feb 2018"Our campaigns are not isolated; our strength & success largely due to the support we give each other." Save Earl's Court Supporters Club 18 Feb 2018"Solidarity for ever." Save Wornington Campaign 23 Feb 2018"We support you in your efforts to hold these organisations to account over their mishandling of community assets"